Last month, I shared about the history of the West Point Military Academy. If you missed that post, you can read it here: https://www.hhhistory.com/2018/06/west-point-us-military-academy.html. 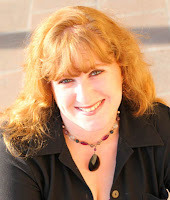 So, who among those reading this blog enjoy the theatre? I'm not referring to the movie theater, although going there can also be enjoyable. No, this would be live theatre performed on a stage of some sort and oftentimes adapted based upon the crowd of those gathered to watch. For as long as I can remember, I have always loved performing. Even as a little girl, I craved the spotlight and thrived when I was the one on stage. Some might have even called me a "ham." *grins* How about you? What theater experiences have you had? 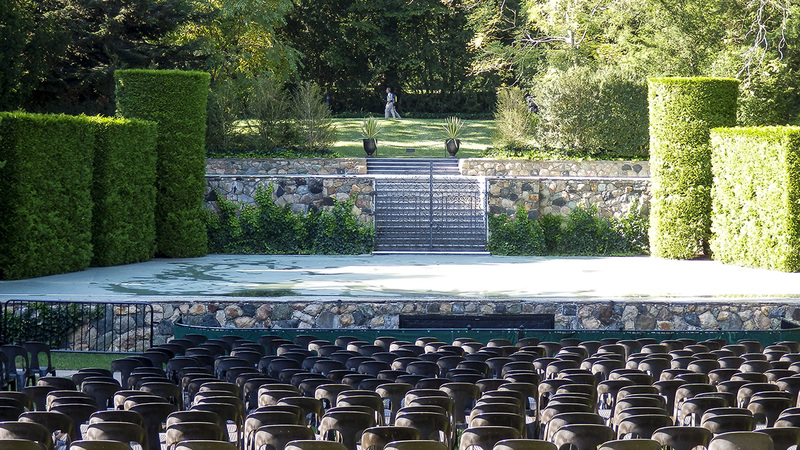 Would you believe commercial outdoor theater has only been in existence for a little over 200 years? This obviously doesn't include Shakespeare's performances for the common people, as those were available to anyone at no charge. 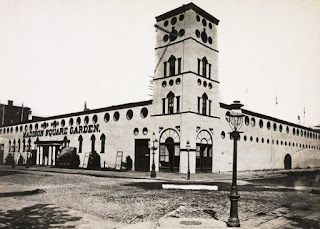 In 1800, though, chef-turned-theatre manager, Joseph Corre, opened the first *commercial* outdoor theatre on the northwest corner of Leonard Street and Broadway in New York City. It was called The Theatre at Mount Vernon Gardens and was situated within Corre’s private outdoor park and tavern. When I first read about this, I thought it was the Mt. Vernon in Virginia owned by George Washington, but this one is entirely different. Mount Vernon Gardens was among the first of many New York “gardens” that became popular hangouts for hot and tired city dwellers looking to escape the hustle and bustle. It was certainly the first of New York’s gardens to offer professional theatre. The performance advertised for the first evening was entitled Miss in Her Teens; or the Medley of Lovers. Playing the leading roles were some of New York’s top performers, including Joseph Jefferson I and Lewis Hallam, Jr., both on loan from the nearby Park Theatre–which was on summer hiatus. No images survive of Corre's Mount Vernon Gardens, but this print to the left of Vauxhall Gardens in 1803 gives a sense of what these New York pleasure gardens were like. Today, the site of Corre’s Mount Vernon Gardens is deep within lower Manhattan, just two blocks north of City Hall. If you can believe this, though, it was out in the country in 1800 and served as a refreshing rural getaway. Rural? In the middle of New York City? Surprising, isn't it? Manhattan at one point wasn't all cobblestones and paved sidewalks or roads. One of my all-time favorite locations for outdoor theatre is Longwood Gardens in Pennsylvania. Growing up around the Mid-Atlantic area, I had the good fortune to take several school field trips there, and my family visited many times as well. As an adult, I made a few trips there with friends. Living in Colorado now, it's quite difficult to find anything even remotely similar, although the Denver Botantical Gardens do suffice and are enjoyable to visit. 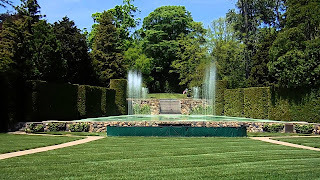 Longwood Gardens, though, was created by one of the "American royalty" families of DuPont, for the enjoyment of the general public. 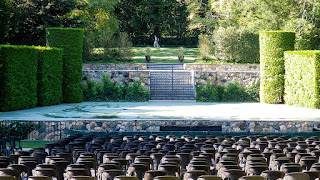 No only are the gardens themselves amazing and impeccably maintained, but their outdoor theatre is a place for a wide variety of concerts, performances, and even weddings throughout the spring and summer months. My most memorable visit was when I saw Brigadoon performed here. It left a lasting impression that has stayed with me for over 25 years, and it inspired me to see the other versions of this musical, as well as purchase the soundtrack performed by the original Broadway cast plus the one from the MGM film from 1954. Oh, I could sing those songs for hours...but I digress. Theatre was only a sidelight for the Mount Vernon Gardens. For the most part, the main function was as an outdoor tavern–a place for New Yorkers to sip a beverage within a pastoral setting just minutes from downtown. As the popularity of “gardens” grew, they employed a wide variety of events and performances to entice visitors. By mid-century, New York’s gardens became competition to legitimate theatre, especially during the summer months. But instead of fighting, many commercial managers embraced the opportunities summer theatre offered. 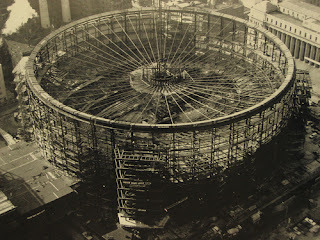 Eventually, the term “garden” became associated with any multi-purposed indoor facility–hence, Madison Square Gardens. Unfortunately, Mr. Corre’s Mount Vernon Gardens didn’t last as a theatrical venue. After three seasons, the formal theatrical offerings ceased, though the facility continued for several more years, offering concerts, pyrotechnical displays and various theatrical events typically found at New York’s other private gardens. Corre’s innovation was quickly picked up by others, though, and within 20 years, there were a number of garden theatres successfully operating in New York City. Some were roof gardens, operating on top of buildings and providing extra income for property owners. 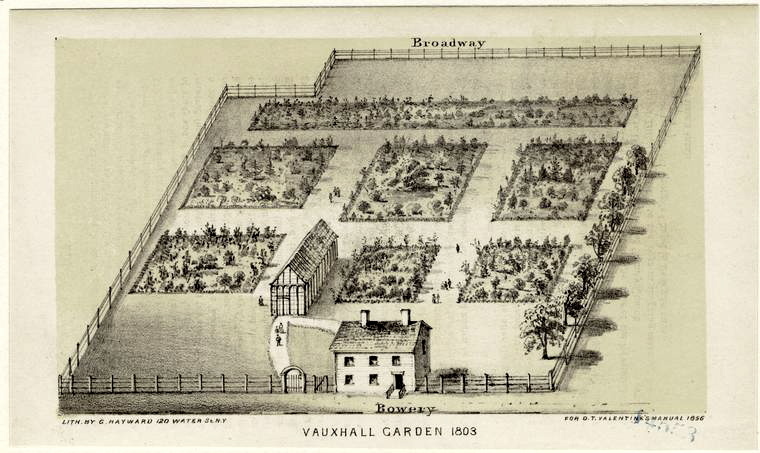 Among the best known of these early outdoor facilities were Columbian Gardens, United States Gardens, and Vauxhall. * Have you ever attended a play or performance in the outdoors? What was it? Where? * Have you ever performed outside in any venue? * If you could go back in time to Manhattan in 1800, what do you think would surprise or enthrall you the most? I think it was a kind gesture for private landowners to even think of offering a sanctuary in the outdoors for city dwellers. I'm not sure that would happen nowadays if parks were not already established. We seem to have trouble keeping the beautiful spaces we have. Connie, I sadly have to agree. It seems development and over-development is the higher focus these days. It's why I am always grateful when local and national governments agree to protect our beautiful spaces, and it's thanks to people who mobilize protection efforts. How interesting! I love theater, and my family runs a small Christian musical theater company. We've had a number of fun outdoor theater experiences watching plays in the summertime over the years, from "Shakespeare in the Park" to the original play Black River Traders when we lived in northwest New Mexico, which chronicles some of the early history of the region and interactions of the Navajo, Hispanic, and European Immigrant cultures that convened there. It was performed in an amazing outdoor theater built into the natural sandstone of the desert, and watching it on a moonlit desert night was a never-to-be-forgotten experience! Wow, Kiersti! That is fascinating history as well! Sounds like that open air theater built into the sandstone is a sight to see. Love knowing you still have outdoor theater experiences today. I'm sure it's a lot of work owning a theater company, but also greatly rewarding.